Work Shorts provide you with a comfortable and easy fit, but also with utility pockets and hammer loops to keep your tools close by while you work. These 8 oz. lightweight shorts facilitate easy movement like kneeling and squatting. These lightweight duck carpenter shorts by Dickies take attractive work clothing to the next level. The lightweight duck fabric is soft and comfortable. 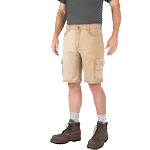 Made from tough yet soft flex fabric in a 65 percent polyester and 35 percent cotton blend, these cargo shorts are highly durable and long lasting. Made of a mix of 65% polyester and 35% cotton, bringing with it the best of both worlds’ textile properties. These lightweight easy to move around shorts are made of twill and weigh just 81/2 oz. The shorts sit comfortably at the waist and give a roomier fit at the seat of the thigh. We bring to you some of the hottest selling work shorts in the market from the reputed brands of Dickies and BlakLader. Our work shorts collection is made up of a range of shorts like carpenter shorts, painter shorts, heavy worker shorts, cargos, and three quarter pants. We offer you this extensive range so that you can take your pick to match your needs to a tee. The shorts apart from coming in different designs and sizes are offered to you in a wide choice of colors and cuts. Each work short presented here has been specifically designed keeping in mind the heavy duty nature of work you need them for. Designed to perfection keeping comfort, durability, and style in mind these work shorts are the just thing you need. The work shorts come in blends of cotton and poly, cotton and nylon, or 100% cotton, each with its unique offering of keeping you dry and cool in hot working conditions. You can even choose by the inseam specifications provided for each short to know which length suits you the best. The shorts have been masterfully tailored to allow easy movement while working like walking, squatting, climbing or bending. Provided with hammer loops, and multi-use tool pockets, phone holders, nail pockets, each short has been created and selected keeping your work requirements in mind. We assure quality workmanship in each one of our products. Each work short comes with strong metal zippers, triple stitched seams to prevent wear and tear with constant use, and strong belt loops to help the shorts sit comfortably at your waist.